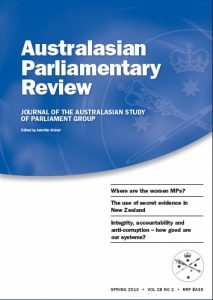 Parliaments’ Reputation as the ‘Pre-Eminent’ Institution for Defending Rights: Do Parliamentary Committees Always Enhance this Reputation? New Kids on the Block or the Unusual Suspects? Is Public Engagement with Committees Changing or is Participation in Committee Inquiries Still Dominated by a Handful of Organisations and Academics? Fixed Reporting Dates for Senate References Committees: Are They Effective?